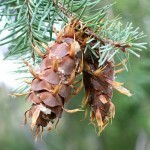 Pseudotsuga menziesii var. 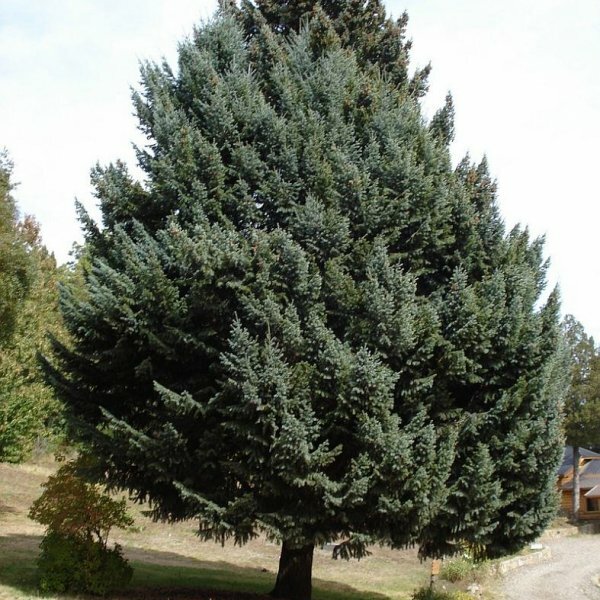 glauca of the Rocky Mountain region is a medium-sized to large tree. It is distinguished within Pseudotsuga menziesii by its shorter, blue-green needles and smaller cones with bracts bent upward. Rocky Mountain Douglas-fir is a valuable timber tree. 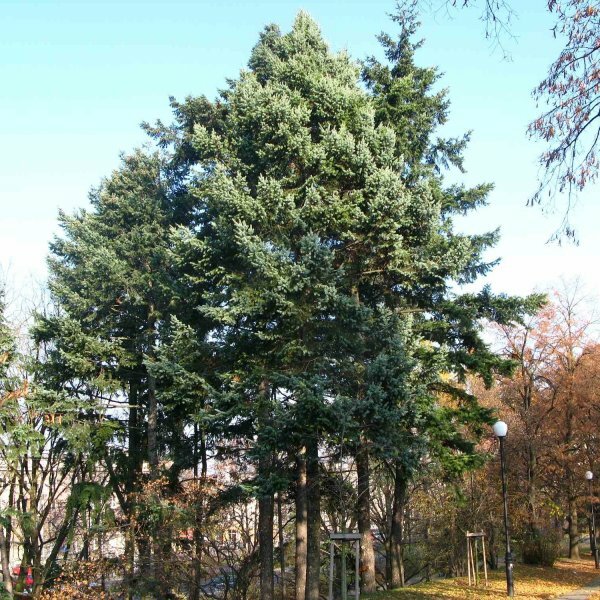 The wood is exceptionally strong and is used for structural timber as well as poles, plywood, pulp, dimensional lumber, railroad ties, mine timbers, log cabins, posts and poles, fencing, and firewood. Rocky Mountain Douglas-firs are also cut and sold as Christmas trees. 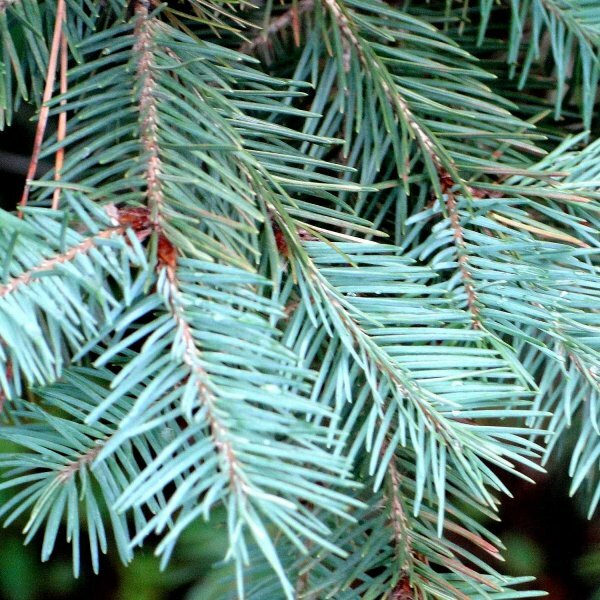 Douglas Fir grows best in full sun and prefers slightly acid, well-drained soil. 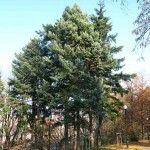 Young trees are pyramidal, with branches that extend to the ground, so they make effective screens. But, as the years go by the bottom branches fall away. 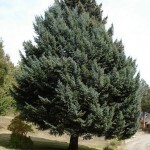 In the landscape, large forms are best grown as specimens for large open spaces, while dwarf forms are suited to smaller garden spaces. Landscape uses - Rocky Mountain Douglas-firs could be used as Christmas tree, valuable timber tree. 2. 30-60 days cold moist stratification recommended for a higher germination rate. Stratify seeds in a plastic bag full of moist sand inside the refrigerator for 30-60 days. Keep the sand barely moist during the cold stratification period. 3. Prepare a pot for each seed. Fill 20 cm (8") plastic pots with garden soil taken from the bed where the trees will eventually be planted. Sow one seed in each pot at a depth of 2-2.5 cm (1"). 4. Water the seeds to a depth of 8 cm (3") after planting them. Maintain moisture during the germination process. 6. Watch for sprouting one month after sowing. Maintain the same light and moisture conditions provided to the seeds during germination until they grow to 10 cm (4") in height.